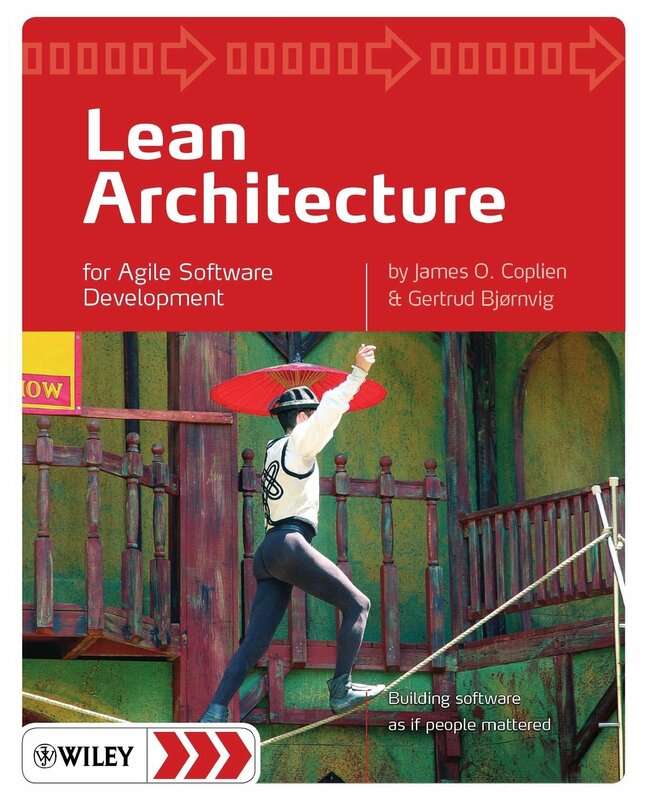 Four years after this book came out, Agile Architecture has at last become a Thing. But as the nuance of its title hints, this book is not fad-driven. It is a carefully-thought out exposition of what architects can learn from lean and agile ideas, and what they can do better as a result. Well. It’s partly that. If you are a practising architect, it is actually four must-read books in one. If you are not, you might dismiss this book for two reasons. The first, that judging by other reviews & my own experience, the homespun style of the first half does not suit a bullet-pointed gimme-the-headlines-now generation. The second is that if you have not experienced the pitfalls of architecting and doing software in a real organisation with actual people in it, then Coplien & Bjørnvig’s pearls of wisdom may impress you much as the agile manifesto might impress a cattle rancher. It is not a beginner’s book. It is the mature distillation of the sweat-soaked notebooks of a fellow-traveller who has stumbled over rocky terrain, been through the tarpits and has some hard-bloody-earned (and, academically researched) wisdom to share as a result. 1) The (literally) decades of experience of a leading practitioner & thinker in the field. 3) Which leads to that which for me, as a more techy-focused reader, was the marvel of the book. Clements et al in “Software Architecture in Practise” offered attribute-driven design, a partitioning of the system based on a priority ordering of, primarily, technical quality requirements. Coplien & Bjørnvig all but deduce a partitioning based on the priority ordering of people: Users first, Development team next. “The end-users’ mental model” is the refrain on which they start early and never stop hammering. From this they suggest that the first partitioning is What the System Is from What the System Does. I am tempted to paraphrase as, Domain Model from Use Cases. But their point is partly that this also neatly matches the primary partition by rate of change, because the last thing to change in a business is, the business of the business. If you’re in retail, you might change what and how and where you sell, but your business is still Selling Stuff. And at lower levels inside the organisation too: an accounting department, though there has been five thousand years of technology change, still does accounting. The users know this. They understand their domain and if the fundamental form of your software system matches the end user mental model then it can survive–nay, enable!–change and stay fundamentally fit for purpose. Second, don’t fight Conway’s law. “Organizations which design systems … are constrained to produce designs which are copies of the communication structures of these organizations”. The deduction for agile teams is, partition so as to maximise the long-term autonomy of your self-organising teams. Even when the team divisions are imposed for non-technical reasons–geography, politics, whatever–still allow that fact to trump more ‘technical’ considerations. This may not match your vision of technical perfection, but it will still be the best way. Ruth Malan recently paraphrased Conway’s law as, “if the architecture of the system and the architecture of the organization are at odds, the architecture of the organization wins”. Don’t be a loser. These points seem to me obvious in hindsight, yet they turn traditional approaches to high-level designs on their head. After considering People, yes we can considering rates of change, quality attributes, technology areas. But it’s always People First. 4) And finally. This is the first book-sized exposition of DCI architecture, which I would describe as an architectural pattern for systems that have users. Having separated What the System Is from What the System Does, DCI provides the design pattern for how What the System Does (the Use Cases) marshals the elements of the What the System Is. There are at least three notable outcomes. Firstly that use cases are mapped closely to specific pieces of code; in the best case each use case can be encapsulated in its own component. Secondly, that the relationship between Domain elements and Use Cases are expressed as “In Use Case X Domain element Y plays the Role of Z”. This brings significant clarity to both, and is part of the key to ‘componentising’ use cases; the Roles needed for a use case become, in the code, its public dependencies. In UML-speak, the Required Interfaces for such a UseCaseComponent are the roles needed to ‘play’ the use case, and those roles are Interfaces which are Implemented by Classes in the Domain Model. Coupling is reduced, cohesion is gained, clarity abounds. Thirdly, the simpleness of the mapping from business architecture to code is greatly increased. Suddenly one can draw simple straight lines between corresponding elements of architecture and code. The authors say of their work, “This book is about a Lean approach to domain architecture that lays a foundation for agile software change”. To my mind, this hits the agile architecture nail on the head. Agile software development always only ever succeeded at scale because the people doing it either knew, or had given to them, enough architecture to make it work. Software Agility, just like every other software Ility, must either be supported by the architecture or it ain’t gonna happen. But the best thing I got from this book was the proof, before my very eyes, that correct technical design flows from knowing how to put the human beings central. This entry was posted in Agile Software Architecture, Code, Computers and tagged agile, agile architecture, software, software architecture, software design on 5th December 2014 by Chris F Carroll.